To date this year, the clear winner of the (no) sticker auto wars has been Upper Deck. In fact it hasn't even been a competitive fight. Panini doesn't seem to care what collectors really want and continues to take the easy way out despite having a less jammed release calendar that would seem to allow for the extra time required to produce a non-sticker auto chechcklist. 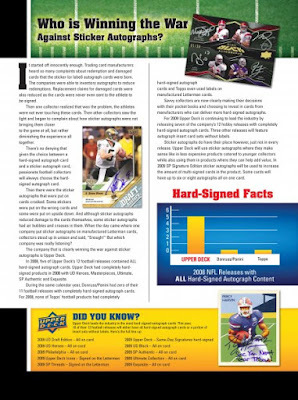 Topps has apparently decided to become competitive in this aspect of marketing as referenced by their post on their Twitter feed (@toppscards) which stated that 70% off all autographs in the new T-206 will be hard signed. What a welcome relief that is given the nature of the retro themed product. It actually should be a law. If you produce a retro themed product, you can only use hard signed autos. Upper Deck has clearly made this a priority and is touting that as a key selling point of their products. The recently posted an image of an article (of which I have requested a pdf due to it being very difficult to read as a jpeg) on their Facebook page that lays out the statistical facts for their products. In an industry that relies on consumer's discretionary income, it is imperative that manufacturers strive for a deliver value in every product. Collectors have made it clear which autograph format that value more and it is time that they all pursue this as aggressively as possible. UD is making a great effort, but if you believe them that every auto in UD Draft football is hard signed, you may end up being disappointed. I bought a box and received a sticker auto on a scouting report card. The odd thing was I got an auto from the same player on a regular auto card that was hard signed. That IS very odd. Thanks for pointing this piece of mis-information out.